When it comes to indulgence, for me it’s about what choices you make. 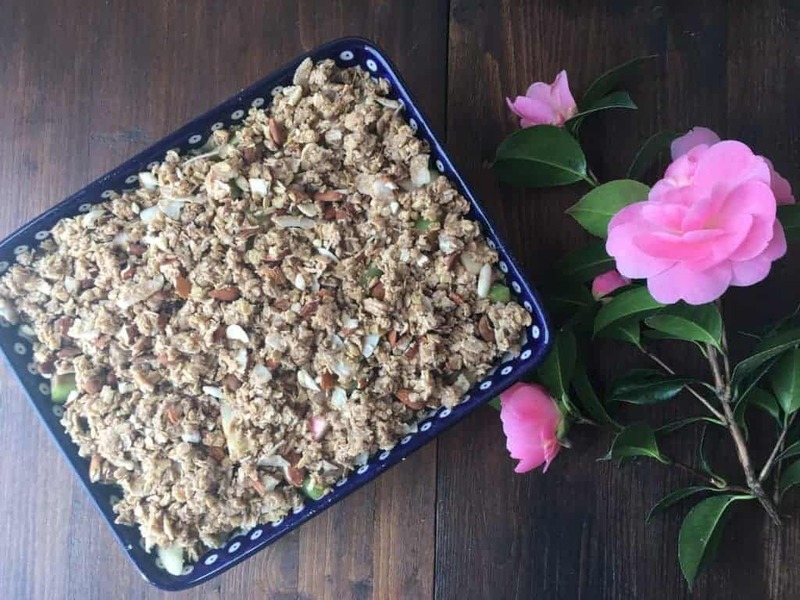 With this healthy rhubarb and apple crumble recipe you can feel a lot better about your choice as it has minimal sugar. Also, it is jam packed with fruit. 1/ Preheat the oven at 180 degrees. Wash the rhubarb and cut in 4cm strips. Wash the apples, don’t peel them as most of the good stuff is underneath (although some of it will be lost with cooking so be mindful of that) but it also saves times and gives a nice almost peach like texture. Royal Gala variety still holds its shape nicely once cooked. Cut them in 2cm chunks and discard the core. 2/ In a pan put ½ tbsp of coconut oil (the oil will be hard but you will be melting it in the pan), 1 ½ tbsp honey, 2 tsp vanilla paste and 2 tsp of cinnamon powder and gently melt over a low heat. Pour the liquid on top of the apples and rhubarb and mix together well. Place in an oven proof dish. 3/ Take the rest of 1tbsp coconut oil (again the hard one) place it in a pan and gently melt. Take of the heat and add the oats and mix well. Don’t worry if you think there isn’t enough oil. You don’t want the oats to be very heavy, but it’s more to help the oats achieve flavour in the oven. Add the pistachios and mix well again. Take the mixture and sprinkle over the fruits until well covered. 4/ Bake in the oven at 160 degrees for a good 40-45 min or until you see the mixture bubbling and fruit breaking down (if you have a transparent oven dish) or you see the fruit juices bubbling in the corners of the mixture and the top is nicely browned but not burnt.